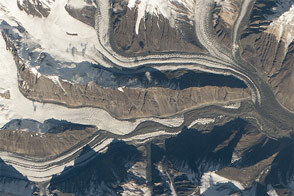 Many scientists regard receding glaciers as a symptom of global climate change. While certain types of glaciers—such as surge glaciers and tidewater glaciers—are actually expanding, there are many areas where scientists report glaciers are wasting away and that climate change is the culprit. For instance, 150 years ago there were 147 glaciers in Glacier National Park. Today, only 37 glaciers remain, and scientists say they will likely completely melt by the year 2030. Similarly, glaciers all across the Alps are retreating and disappearing every year. But it is not feasible to visit and measure every major glacier on Earth. There are almost 160,000 glaciers in Earth’s polar regions and high mountain environments. 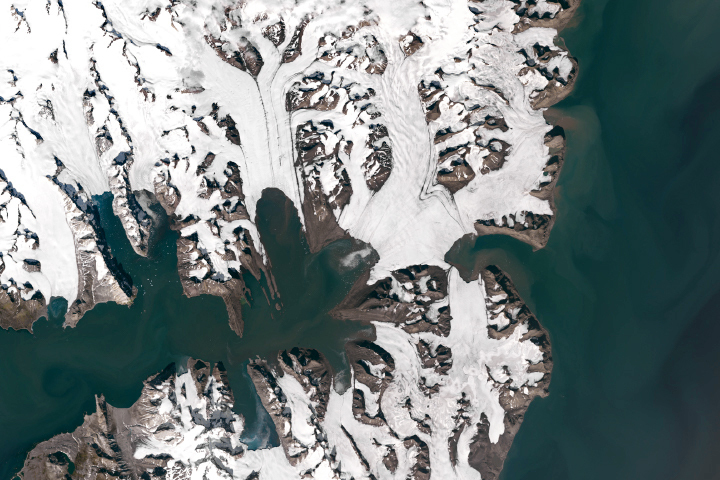 Therefore, researchers are increasingly using satellite remote sensors to routinely survey our world’s glaciers in a fraction of the time and cost it would otherwise take. 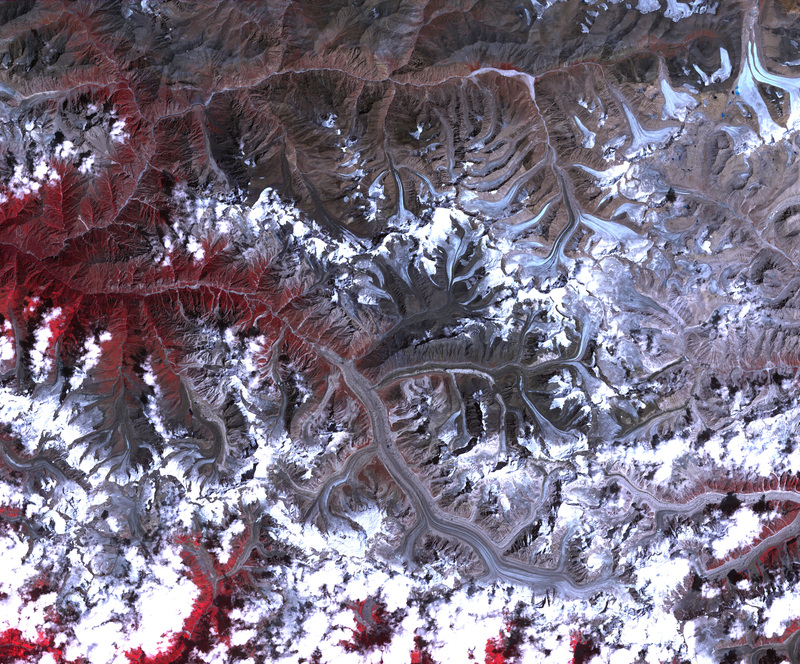 The false-color image above shows the Gangotri Glacier, situated in the Uttarkashi District of Garhwal Himalaya. Currently 30.2 km long and between 0.5 and 2.5 km wide, Gangotri glacier is one of the largest in the Himalaya. Gangotri has been receding since 1780, although studies show its retreat quickened after 1971. 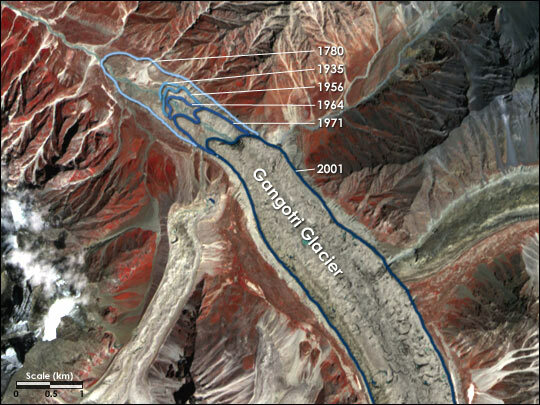 (Please note that the blue contour lines drawn here to show the recession of the glacier’s terminus over time are approximate.) Over the last 25 years, Gangotri glacier has retreated more than 850 meters, with a recession of 76 meters from 1996 to 1999 alone. NASA image by Jesse Allen, Earth Observatory; based on data provided by the ASTER Science Team. Glacier retreat boundaries courtesy the Land Processes Distributed Active Archive Center. Currently 30.2 km long and between 0.5 and 2.5 km wide, Gangotri glacier is one of the largest in the Himalaya. Gangotri has been receding since 1780, although studies show its retreat quickened after 1971.